KUALA LUMPUR (Jan 27): Prime Minister Datuk Seri Najib Razak is expected to have an audience with the Tunku Temenggong Kedah Tan Sri Tunku Sallehuddin Badlishah to nominate a new menteri besar, after talks with incumbent Datuk Seri Mukhriz Mahathir reached a dead end. A source said the Umno president was expected to meet the Tunku Temenggong by today, at the earliest or by Thursday, for his assent to replace Mukhriz, after 19 Umno assemblymen signed a statutory declaration stating loss of confidence in the latter’s leadership. Talks between Najib and Mukhriz apparently failed after the son of the country's longest serving prime minister, Tun Dr Mahathir Mohamad, rejected an offer to be appointed deputy minister in the Federal Cabinet. "The Umno president will have a palace audience today or after the conclusion of the medal awards ceremony on Thursday. 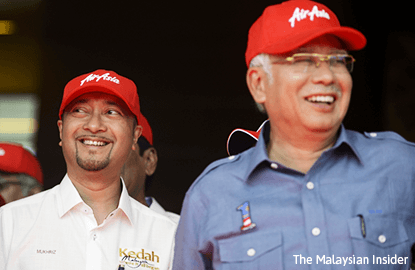 "Mukhriz has reached the end of the line by rejecting the offer to return to Putrajaya as a deputy minister," the source said, adding that the offer was made when Najib met Mukhriz in Langkawi last Sunday. Several Kedah assemblymen also meet Najib in Putrajaya yesterday to share their views. Kota Seputeh assemblyman Datuk Abu Hassan Sarif said in that meeting, he had appealed to Najib to let Mukhriz complete the latter's first term as menteri besar. Abu Hassan declined to reveal the identity of other representatives present in the same meeting. To date, 19 assemblymen have reportedly signed a statutory declaration to reject Mukhriz. A palace source said, however, to date no request for an audience with the Tunku Temenggong has been made, from Najib or any other party to propose the candidate to replace Mukhriz. Sources said all 19 representative signatures were obtained last Monday but Najib had been busy with Dewan Rakyat proceedings on the Trans-Pacific Partnership (TPP) and had delayed the palace appointment. In other developments, a source said there were instructions from the top to several Kedah executive council (exco) members to boycott the exco meeting today, as a sign of no confidence in the state administration under Mukhriz. "Nine exco members were ordered not to attend today's meeting, however Mukhriz is confident and optimistic that the excos will attend. We have to wait and see," the source said, adding it would be difficult for Mukhriz to defend his post. "Last Monday, Mukhriz had met with the Tunku Temenggong to explain the state's political situation, but the palace is still monitoring the situation and not interfering," the source said. Last Wednesday, Kedah Umno deputy chief Datuk Seri Ahmad Bashah Md Hanipah called a press conference declaring that 14 out of 15 Kedah Umno division leaders wanted Mukhriz out and were appealing to Najib, who is also Umno president, to remove him. He said Mukhriz had failed to unite the party leadership and machinery, adding that the son of former prime minister Tun Dr Mahathir Mohamad had no strategy for Kedah Umno to face the 14th general election, due in 2018. Mukhriz became menteri besar after the 13th general election, when Barisan Nasional wrested the state from PAS.